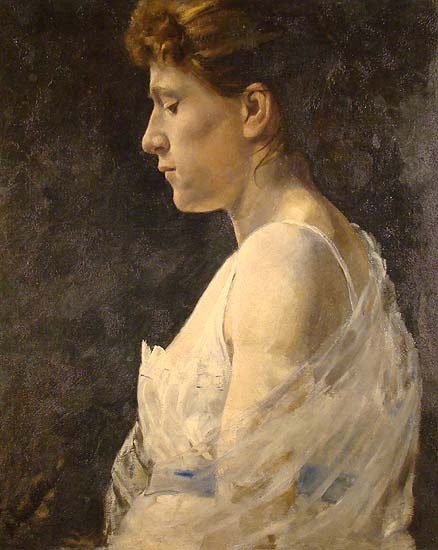 This portrait can be seen hanging on the wall of Trego's studio in a photograph taken there in 1893, but it can not be established definitively that Trego painted it himself. There is no signature, nor are there any references to it in his correspondence, or elsewhere. The work appears to be a highly skilled sketch, and not a finished portrait, but the style does not resemble Trego's known portraits and portrait sketches. The painting has been attributed to Trego since at least the 1960s when it passed through both Freeman's auction gallery and the Newman Galleries in Philadelphia. In July 1967, Walter A. Newman, Jr. sent a 35mm color slide of the painting to Helen Gemmill of the Bucks County Historical Society, who was researching Trego at that time. Ms. Gemmill deposited the slide with her other Trego materials in the Bucks County Historical Society. It was apparently the Newman Gallery that affixed a small label on the painting identifying the work as that of William Trego. Unfortunately, neither Newman Galleries nor Freeman's auction have retained any documentation on the painting. Thus the rationale for the attribution to Trego is unknown. The ownership and location of the painting immediately after 1893 is uncertain. It does not appear in any other photographs of Trego's studio after 1893. It came to Freeman's auction gallery in Philadelphia sometime in the 1960s and was subsequently sold at auction to Newman Galleries no later than 1967. It has passed through three private collections since that time. When the painting purchased by the Newman Gallery in the 1960s, it was treated by their conservator. The painting was relined. The original stretchers were discarded. There are no surviving notations as to any inscriptions or labels which might have existed on the reverse. The painting is in excellent condition. < Bust of a Distant Relative, n.d.